Religion and Diversity Project - Why Organise a Religious Leaders Panel? In their teaching of undergraduate courses on the sociology of religion at the University of New Brunswick, Nancy Nason-Clark and Cathy Holtmann have found that including a religious leader’s panel as part of the course can achieve several ends. It provides students the opportunity to meet with religious leaders in their community. At least half of the students have no religious affiliation and most of those that have one have only interacted with people from their own religious group. Students, like many in Canadian society, have stereotypes about religious people and clergy. The experiences involved in organising a religious leaders panel can help to break down these stereotypes in ways that cannot happen simply through reading texts or listening to lectures. Students can learn how to ask pertinent questions to religious leaders in order to obtain information that is relevant to the event's objectives. Asking good questions in a public forum is similar to asking good questions in a personal interview – it takes preparation. Teaching the process of formulating good questions may require several classes but this will offer the students valuable research and social skills. A forum involving local religious leaders helps in developing a relationship between the university and the community. Through inviting religious leaders to speak about questions that interest university students, they will learn to respond to the information needs of those outside their religious groups. University instructors and students will learn about the practices and attitudes of contemporary religious groups as well as the challenges that they face. Introducing new local religious leaders or groups can lead to further collaboration as well as a widening of a scholar’s research network. Decide on a clear focus for the panel before you approach religious leaders to participate. The focus might be an overview of basic beliefs and practices; it might be the theme of a workshop or conference; or it might be the subject of a film or documentary. You will need an idea of what you would like the religious leaders to talk about and it should draw on their expertise. Decide which leaders you want to invite based on information from your own research networks or from people that you trust. Not all religious leaders are good representatives of their groups or good public speakers. Some religious leaders cannot engage in respective dialogue with people from other faith groups. Keep in mind that any particular faith tradition is diverse therefore, religious leaders can be invited to represent internal diversity among Muslims, Jews, or Christians, for example. Having four to five participants on a panel discussion is ideal. Set a date and time for the panel. Your students will need some class time to familiarize themselves with basic aspects of religion. This will enable them to prepare good questions. The entire event should not last longer than two hours. Contact the religious leaders well in advance of the panel date. Like you, religious leaders have busy lives and full calendars, and need ample notice (months not weeks) in order to participate in an event. If you want to organise a religious leader’s panel near the end of a course, invite the leaders prior to the start of the semester or during the first week of classes. Once leaders have accepted to participate in the panel discussion, provide them with clear information about all aspects of the event. This can be done with the initial contact, but you will also want to provide this information in writing (usually via email). We have found that it helps to begin a forum with leaders each taking about five minutes to make prepared comments in relation to the focus of the event. Like university professors, religious leaders like to speak to a captive audience, so make sure you are clear about how long you want them to speak and how long the question period and discussion will last. Advise the leaders that the students will be asking them questions that they have prepared. Give the leaders information about the other panel participants and the characteristics of the audience. Indicate if it is a first year undergraduate class or a graduate seminar. If you plan on recording the panel, you will need to inform the leaders and get their consent. A couple of weeks before the event, contact the leaders by phone or email and remind them of their commitment to participate. Offer them details about the start time and the room location. Have your students prepare questions for the panel members through a structured process. Begin by brainstorming and recording all possible questions – this is best done in small groups. No questions are excluded at this initial stage. Once all of the questions are recorded, have the class read them and ask if there are any questions that make people uncomfortable and why. Whether it comes up in the discussion or not, talk to the students about posing open ended questions that religious leaders will be comfortable answering. Questions that put religious leaders on the defensive will not lead to useful information or build trust. Questions should be posed in such a way that the leaders feel that students are interested in trying to understand their point of view and what they have to say about particular religious beliefs and practices. The questions should also be relevant to the course materials or the topic of the workshop. It may take several classes to refine the list of questions. The questions can be grouped according to themes and each theme given a certain amount of time during the panel so that all themes are covered. Assign each student with at least one question to ask during the panel and determine the order in which the questions will be asked. Get students to volunteer to thank each individual religious leader at the end of the event. The students can prepare a few words and write a thank you card. When the panel takes place, you are the host, MC and gatekeeper. You should start and finish on time. Inform everyone present of how the event will proceed. Welcome the religious leaders as guests and have short introductions prepared for each of them. Ensure that you have control over the audience. If you are organising the forum for a class make sure that only those registered in the course ask questions. 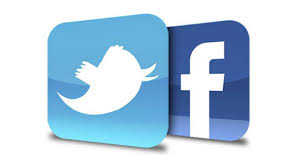 If you are organising a public event have a plan for how questions are going to be handled. Begin with the prepared questions so that members of the public are informed about the nature of the discussion. Religion can raise intense emotions among people and you need to be prepared for disrespectful questions from non-class participants or individuals who monopolize the floor in order to make their views heard. Have a plan for dealing with such situations. When the event is concluding, allow enough time for students to thank the religious leaders individually. University items like mugs or pens make good mementos to include with a thank you card. The religious leaders panel can be part of a student assignment. In our classes, students get credit for participating in the formulation of the questions, for attending the panel and asking questions, and for writing a reflection on the panel after the event. Sometimes we have received permission from students to share their reflections on the event with the religious leaders who participated. 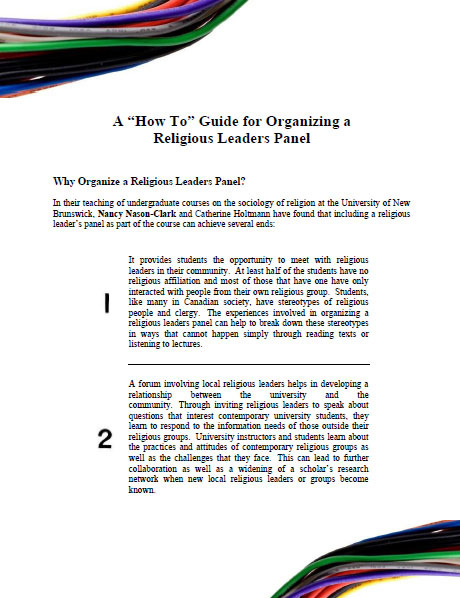 Please click on the image below to download the "How To" Guide for organising a religious leaders panel.